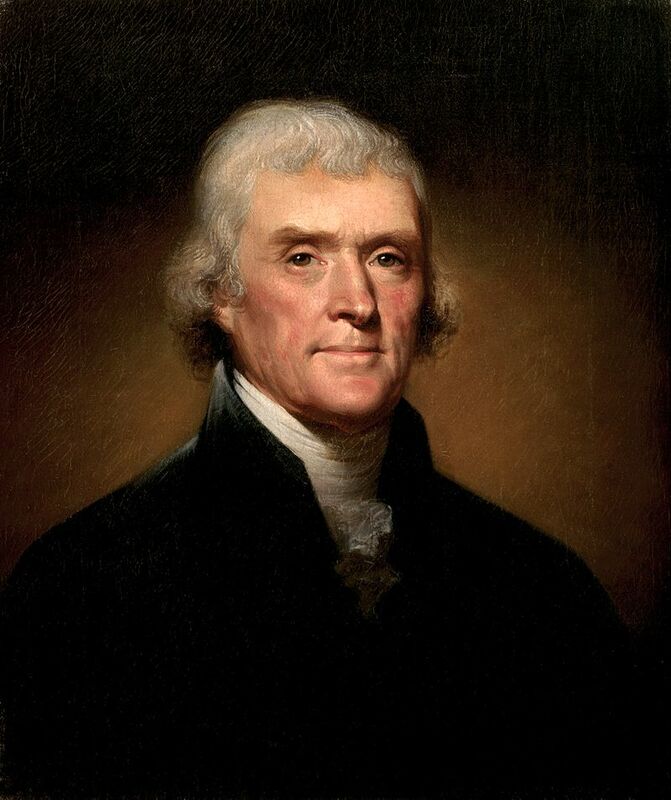 Born in Virginia on April 13, 1743, Thomas Jefferson was a prominent Founding Father of the United States. 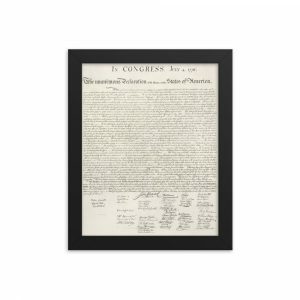 Jefferson was the main author of the Declaration of Independence. Originally, he had been elected Vice President in 1797 under John Adams, serving until 1801 when he became the 3rd President of the United States, a position he held until 1809. Jefferson also founded the Democratic-Republican party with his close friend James Madison, who served as his Secretary of State and was the 4th President of the United States. Jefferson returned to America from France in the fall of 1789. Upon his arrival home in Virginia, he was appointed the first Secretary of State by President George Washington, a position he accepted. As Secretary of State, he constantly clashed with his colleague, Secretary of the Treasury, Alexander Hamilton. The two disagreed on foreign policy and also interpreted the U.S. Constitution differently. Jefferson even created the Democratic-Republican party in the early 1790s that opposed the Federalist Party, which Hamilton was a member of. While Jefferson favored strong state and local government, Alexander Hamilton and the Federalists were in favor of a strong national government that also help powers of the economy. In 1796, Jefferson went up against John Adams, who had also been Washington’s vice president, for the presidency. John Adams won 53.4% of the popular vote with 35,726 votes and 71 electoral votes. Thomas Jefferson was right behind him with 31,115 votes, 46.6% of the popular vote, and 68 electoral votes. In total there were 138 electoral votes. At the time, the law stated that whoever got the second highest amount of votes was to become vice president. Since he had come right behind Adams, Jefferson became the 2nd Vice President of the United States. In the election of 1800, Jefferson ran against Adams once again. However, Jefferson beat Adams and ended up tying with fellow Democratic-Republican Aaron Burr. The Electoral College was permitted to vote for two people for the presidency at the time. Originally, the Democratic-Republicans planned for Jefferson to win by one vote by having one elector not vote for Burr. However, each elector ended up voting for both candidates, which ended up in them tying. On February 17, 1801 the contingent election was held and the House of Representatives voted on the two. In the end, Jefferson ended up winning and Burr became his Vice President. On March 4, 1801, Jefferson’s first inauguration was to be held in Washington, D.C., which had only recently become the new capital of the United States. An artillery company fired shots on Capitol Hill early that morning. By walking to and from the ceremony, Jefferson broke the tradition of riding to it in a horse-drawn carriage. Jefferson even gave his speech to be published in the National Intelligencer, a newspaper from D.C. The speech was 1,721 words long and delivered in the Senate Chamber at the United States Capitol. Jefferson wrote the speech with the theme of reconciliation. Afterwards, Chief Justice John Marshall administered the oath of office to him. For the first time as to what would become a tradition, the Marine Band played. It was also the first time a President did not attended the inauguration of his successor. John Adams had been too distraught after losing the election and his son’s death of alcoholism to attend. Jefferson ran for reelection in 1804. He was able to easily defeat the federalist nominee, Charles Pinckney. The electoral votes were 162-14 in Jefferson’s favor. It seemed that the Federalists were also beginning to fade away for the time being. On March 4, 1805, George Clinton replaced Aaron Burr as Vice President. The Twelfth Amendment to the U.S. Constitution was ratified in 1804 to fix the problem that had arisen with the election in 1800. it made it so electors were required to vote separately for president and vice president. Perhaps the most significant achievement during his presidency was the Louisiana Territory. They purchased it from France for fifty million francs along with a cancellation of dets for eighteen million francs. They ended up paying sixty-eight million francs for this purchases in the summer of 1803. The territory was over 820,000 square miles, doubling the United States. It ran from the Mississippi River to the Rocky Mountains to the Gulf of Mexico. Even some of modern day Canada was apart of the purchase. Following this purchase, Jefferson persuaded Congress to fund an expedition through the new land. So, he commissioned Meriwether Lewis (his personal secretary) and William Clark (Lewis and Clark) to lead an expedition through the new territory they had acquired with the purchase. They were also sent to explore the uncharted area beyond towards the Pacific Ocean. Today, their expedition is known as the Corps of Discovery. It lasted two years, from 1804-06. It resulted in valuable information about what lay beyond them, scientifically and geographically. Jefferson, influenced by various exploration accounts, decided it was of importance to claim to “discover” the Pacific Northwest and the Oregon territory. He believed if they did that, they could establish an American presence so Europeans would not make any claims on the land. He also believed that they could promote commerce and trade by finding a passage from the Northwest to the Pacific. The Corps of Discovery was not the only expedition Jefferson organized. He also put together an expedition to the Ouachita River from 1804-05 with William Dunbar and George Hunter, The Thomas Freeman and Peter Custis expedition in 1806 on the Red River, and the 1806-07 Zebulon Pike Expedition into the Rocky Mountains. During his presidency, Jefferson continued with Hamilton’s programs of a national bank and tariffs. Those imprisoned under the Sedition Act, which expired in 1801, were released. Also, the Federalists gave Jefferson permission to select his own cabinet and others he appointed. Seeing the national debt as a cesspool of corruption and patronage, Jefferson wanted to get rid of it. He warned his Secretary of the Treasury, Albert Gallatin, that it was essential they eliminated the debt. Even though he felt it important they end the national debt, the Louisiana Purchase was made with borrowed gold from England. To pay for it, he used Treasury bonds. Jefferson held beliefs that to build foreign credit, the nation did not need to be in debt. On the other hand, Hamilton had vigorously advocated for this, especially during his time in Washington’s cabinet. While in office, Jefferson repealed many taxes imposed by the Federalists, one of them having started the Whiskey Rebellion from 1791-94. In his eyes, the government could operate with only customs revenue and that taxes were unnecessary. 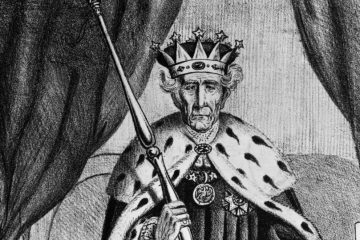 His policy may have been originally successful, but it ended up become disastrous when the Napoleonic Wars between Britain and France were interrupted by American trade. Another thing Jefferson cut was the size of the military, as it was unnecessarily draining the republic’s resources. Adams’ administration had created a large navy that Jefferson decided to cancel. Federalists immediately criticised him for it, saying it made the nation vulnerable to potential foreign attacks. In response, Jefferson stated that he believed that if there were an attack, citizen soldiers would step up and defend their nation. However, he did create the Army Corps of Engineers. In 1802, he established the United States Military Academy in West Point, New York on the Hudson so train republican officers. When Jefferson had been elected, many anticipated for him to use patronage and replace Federalists in the government with those from his own party. Instead, he resisted the call and felt that he had the right to replace only top government officials (cabinet members and midnight judges) with his own picks. Jefferson believed that unlike Hamilton Federalists, most Adams Federalists (who were more moderate) could be persuaded to switch to Democratic-Republicans. So, he kept most of the those Adams had appointed in their positions. U.S. presidents continued to follow this under the spoils system until 1828 when Andrew Jackson was elected. Even though Jefferson practiced political moderation towards his opponents, the Federalists, their party had become torn apart by political-in-fighting. Federalists refused to accept the way Democratic-Republicans practiced political campaigning. They also found themselves aghast and disgusted by the populist appeals the party made. Meanwhile, John Jay and John Adams, two Federalist leaders, retired from public life, and Vice President Aaron Burr killed Alexander Hamilton in a duel in 1804. But as the nation expanded even more, more and more found the ideas of Jeffersonian democracy appealing. Jefferson found himself suspicious of federal judges having been appointed by Adams and Washington. In his eyes, a good judge was much higher than those previously appointed. He argued that a bill of rights would give the judiciary power. After much urging from the president, the Judiciary Act of 1801 was repealed by Congress. This abolished many district courts Adams had began creating at the end of his term. Jefferson had battled to repeal the Judiciary Act though. In the end, Congress was successful. This did leave many Federalist midnight judges, as they were called, positionless. Midnight judges had been created to protect the courts from any Democratic-Republicans appointed. Of course, Jefferson created new federal judges instead. Though he tried to prevent it, former Secretary of State John Marshall was appointed Chief Justice of the United States Supreme Court. In fact, Marshall and Jefferson were cousins, yet the two came from different parties. One of Marshall’s first cases was Marbury v. Madison, in which William Marbury requested that a writ of mandamus was issued to Secretary of State James Madison to order the delivery of judicial commissions. Next, the Democratic-Republicans were planning to impeach and remove existing federal judges. First was the Federalist judge John Pickering. Pickering had shown signs of insanity and public drunkenness as well. In 1804, Pickering was impeached by the House of Representatives. Later that year, he was removed from his position. Jefferson then began thinking of how to have Justice Samuel Chase, another Federalist, removed. He said that Chase had told a grand jury that Democratic-Republicans said that they threatened “peace and order, freedom and property.” Jefferson urged for leaders in Congress to begin impeachment hearings for Chase for sedition. 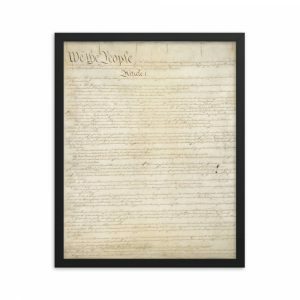 The Democratic-Republicans were unwilling to remove a Supreme Court justice solely for political accusations and believed that this accusation was too similar to the Federalist Sedition Act. In 1804, Chase was acquitted of all charges by the Senate. To this day, Samuel Chase’s impeachment trial remains to be the only one to ever occur in U.S. history. Vice President Aaron Burr shot former Secretary of Treasury Alexander Hamilton on July 11, 1804 in a deadly duel at Weehawken, New Jersey. Hamilton had been one of the main reasons Burr was defeated when he ran for Governor of Burr. After Burr had taken Hamilton’s father-in-law’s Senate seat, the two had become enemies. Hamilton constantly made callous remarks about Burr, especially during the election. Burr believed that his opponent had offended his honor, so he challenged him to a duel. Well, in the end, the duel did not end well, as Hamilton was mortally wounded and died soon after. Burr fled to Georgia when he was indicted for Hamilton’s murder in New Jersey and New York. Despite this, he still remained President of the Senate when Justice Samuel Chase was put on impeachment trial. Jefferson had always been one of Hamilton’s main political enemies, though the president did casually mention him in a letter to his daughter a few days after the funeral. Not only did the deadly duel result in the end of Hamilton’s life, but also the end of Burr’s desire to become president. Burr was rumoured to have started plotting with various western states to secede so they could become their own independent empire. The British Ambassador at the time said Burr wanted to “effect a separation of the western part of the United States [at the Appalachian Mountains]”. And by November of 1806, Jefferson had also begun to believe there was truth to this. There were even reports of Burr recruiting men, stocking arms, and building boats for whatever reason. New Orleans was an especially vulnerable city at the time. However, James Wilkinson, an American general and double agent for the Spanish, turned to Burr. Jefferson soon issued a proclamation that warned that there were Americans plotting to illegally take over Spanish territory. Burr was nationally discredited for this, but the president still greatly feared for the nation. Burr was arrested in New Orleans and put on trial for reason in Richmond, Virginia after Jefferson declared his guilt “placed beyond question” three months earlier in January of 1807. Burr subpoenaed Jefferson to release documents in favor of Burr’s defense that June. In response, Jefferson stated that he was not loyal to burr whatsoever. The government case was weak and Jefferson did not even show up. In the end, Burr was acquitted, but his reputation was damaged forever. After acquiring the Louisiana Territory from the French, Jefferson wanted to gain Florida as well. He did not realize that there were different circumstances with Spain than with France though. As he offered to purchase the land, Jefferson also issued vague threats to the Spanish. Still, Spain refused to even consider the offers. So, he claimed jurisdiction over west Florida. Spain ignored him anyway. In the end, Jefferson was unable to acquire Florida, as Spain had no plans to give it up. The only war declared during Jefferson’s time in office and the first war the U.S. was apart of that took place on foreign soils and seas was the First Barbary War from 1801-05. By that time, North African pirates had been capturing merchant ships from Americans for decades. They would pillage valuables and enslave crew members and also demand they be given huge ransoms for the release of the crew members. Barbary pirates had been protecting American merchant ships while they were still under rule of Great Britain until the 1770s. However, Jefferson refused to pay tribute for protection to the Barbary State and effectively started the First Barbary War on May 10, 1801. Five days later, Jefferson’s cabinet unanimously voted for three frigates and a schooner to be sent to ask for peace to the Mediterranean. This was the first American naval squadron to cross the Atlantic. Commodore Richard Dale commanded the squadron to sail into the Mediterranean in early July. When they stopped for supplies and information on Gibraltar, Dale was informed that Tripoli had declared war on the U.S. already. The international slave trade was to end in 1808 after the twenty-year constitutional ban on ending it. Jefferson called for Congress to ban the slave trade in December of 1868. Jefferson himself owned hundreds of slaves at his Virginia estate Monticello. In January of 1808, the new law became effective and the international slave trade became illegal. This was another one of his major achievements, abolishing the slave trade, right along with the Louisiana Purchase. Originally, Jefferson did not want the U.S. to be on one side of the Napoleonic Wars going on between France and Great Britain. The British Royal Navy was in need of sailors though and seized hundreds of American ships and sailors. This greatly angered the Americans. Jefferson became more and more annoyed with the two at war nations as cut European and British trade. But when the British tried to search an american ship, three men were left dead and eighteen wounded. The public became more and more angry, demanding their president to do something. Jefferson ended up deciding to go with economical Warfare. In 1807, the Embargo Act was passed. It made it so Britain and France were forced to respect that the U.S. was neutral and cut off American shipping to both nations. But when Americans began smuggling to ship goods to Europe, Jefferson found himself forced to call out the military to expand the federal government’s power and patrol the American coast. His support of the Embargo Act ended up severely damaging his reputation and lost him a lot of support by the time James Madison became president in 1808.